The unique beauty of the extraordinary reefs off Taveuni Island make it one of the world’s premier diving destinations. The incredible wealth of life found in the waters here is the reason for the archipelago’s reputation as ‘the soft coral capital of the world’. The Fiji archipelago has hundreds of spectacular and renowned dive sites scattered throughout its waters, many of which are situated directly off the shores of Taveuni Island. Taveuni Dive has over 36 years experience in the diving industry. 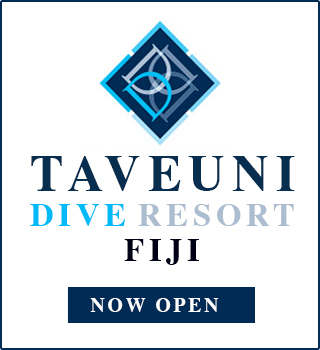 The dive centre has locations at Taveuni Estates, Paradise Taveuni Resort and Matei. We are minutes away from some of Taveuni’s world famous dive sites, including the Great White Wall (an almost luminescent wall of soft coral) and the extensive and colorful Rainbow Reef . Taveuni Dive is a Gold Palm 5 Star IDC facility offering a full range of courses to suit all levels. Our team of highly qualified and experienced PADI instructors and dive masters are committed to your safety at all times. We have 3 boats allowing us to cater to a variety of group sizes. Tui Nunu is a 12 passenger boat, Wananavu is an 8 passenger boat and Unplugged is a 6 passenger boat. All have canopies and ladders and accommodate both the giant stride and roll off entries. All the boats used by Taveuni Dive are fully equipped with safety equipment and are manned by qualified professionals. Our docking facilities are in a protected marina for your convenience and safety. We also have the latest rental gear and dive computers for hire. All of our dive packages include the boat and a guide, along with equipment (such as weights, belts, tank, fills), towels and refreshments. With 36 years under our belt as a PADI facility of the highest regard, we pride ourselves on our professionalism and quality excursions. We also have a sister company called Divers Reef in Colorado, USA. For newcomers to the world of diving, we offer safe and expert training by qualified PADI dive instructors. This is your ideal opportunity to learn about the wonderful underwater world that lies in the warm waters of the Pacific. Divers travel from around the globe to see Taveuni’s amazing corals for themselves. The area is so highly regarded that the Wildlife Conservation Society are working with Fiji to establish a World Heritage Seascape to protect the waters between the biggest islands. Along with the spectacular coral, divers can discover a huge array of colorful reef fish, giant traveli, many different sharks, the occasional manta ray and much, much more.